On our way to the European Youth Championships in Samorin Slovakia we stopped in Vienna. Initially I didn’t want to visit Vienna as I well remember that on our last visit a number of years ago we heard a group of people singing a Nazi song not far from our hotel. And I recall pictures of the enthusiastic reaction of the Viennese to the annexation of Austria by Hitler in 1938. Our hotel was in the Jewish Quarter near the only synagogue to survive Kristalnacht. The synagogue was connected to buildings on either side and unlike other synagogues was not burnt for fear of damaging the adjoining buildings. The square in front of our hotel is called Judenplatz where there is a plaque remembering two Jews killed during a terrorist attack in 1981 on their way to a barmitzvah ceremony at the synagogue. There is a huge community centre there as well. 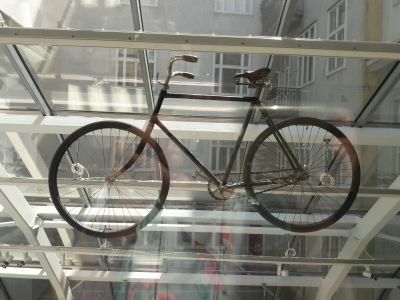 We visited the Jewish Museum. 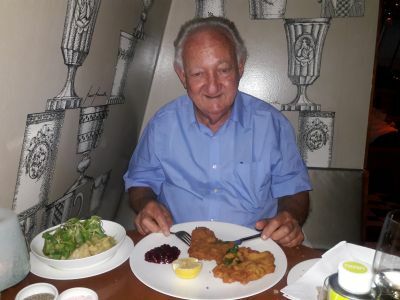 For many years anti-Semitism was rife in Vienna after WWII until Michael Haupt became mayor in 1994 and acknowledged Vienna’s responsibility in the destruction of Viennese Jewry. Today the Jewish Community has about 8,000 members. Interestingly enough about a third of the community are Jews from Bukhara Turkmenistan who emigrated to Israel but eventually chose to settle in Vienna. 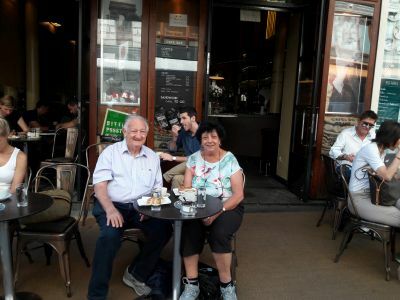 During our two days in Vienna I saw only one man with a kipa; on our second day we heard a lot of Hebrew – obviously Israeli tourists. 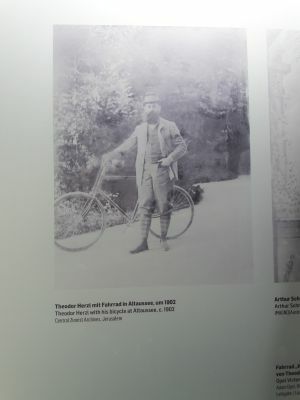 Theodor Herzl lived in Vienna where he was a journalist for the Neue Freie Presse. He was sent to Paris to cover the trial of Alfred Dreyfuss wrongly accused of treason. When he heard the crowds screaming "Death to the Jews" he changed his whole outlook on the solution to the 'Jewish Question,' becoming the father of modern political Zionism. He was buried in Vienna in 1904. In his will he asked that should a Jewish State be founded that his body be interred in Jerusalem. In an emotional ceremony his body was brought to Mount Herzl in Jerusalem in 1949 with representatives from all the Jewish villages bringing soil to cover his grave. 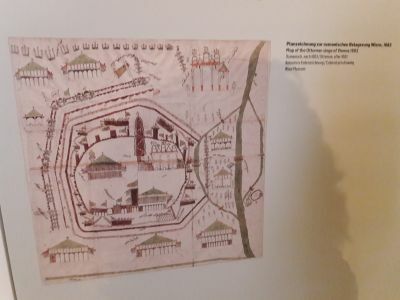 The other thing that caught our attention was a map dated 1529 showing one of the two Turkish sieges on Vienna. The failure of the first siege put a stop to Turkish expansion under Suleiman the Magnificent (the man who built the walls we see around the Old City of Jerusalem today) who had already conquered and annexed part of Hungary. Near our hotel was Daniel Moser, a coffee shop advertising the best coffee in Vienna. 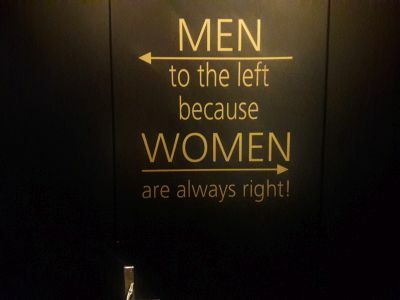 It also happened to have delicious bagels and mozzarella but best of all was the sign by the toilets! 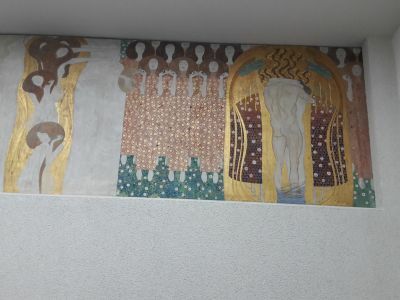 I visited Vienna Secession, which was an art movement formed in the late 1800’s. 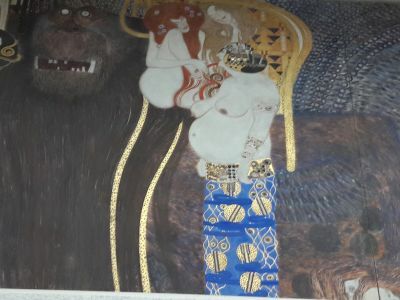 Its first president was Gustav Klimt. Representations of “The Kiss” and his other paintings are all over Vienna, on coffee cups, dishes, scarves, umbrellas and posters. The Kiss is in Belvedere a palace we didn’t manage to visit but his 1902 frieze interpreting Beethoven’s 9th Symphony is in the Secession building. The end of the symphony expresses man’s yearning for happiness with the choir singing Friedrich Schiller’s Ode To Joy ending with “This Kiss to the Whole World.” Another part of the frieze entitiled ‘Intemperance’ with its fat lady particularly spoke to me - but the last scene of Ode to Joy is more famous! 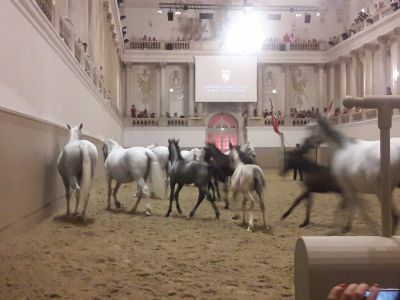 We managed to attend a performance of Piber Meets Vienna to see the Lippizan horses at the Spanish Riding School winter quarters. The stallion pageant is performed only in winter, while in summer the mares with their foals give a performance in this amazing building dating back to 1792 to the reign of Emperor Charles VI. Many of the young horses were dark brown, surprising as their parents are all white. It seems that they are born dark brown but shed their hair which gradually turns white. When we approach horses we are always warned not to put our hands near their mouths because they can bite. Here the foals were frisky but the mares were very gentle and allowed the audience to pat them. 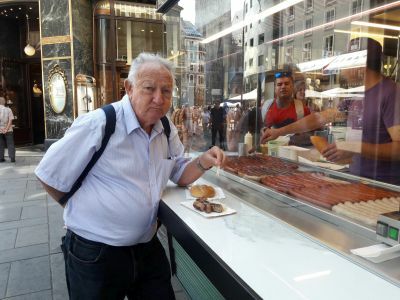 Besides walking a lot through the beautiful streets of Vienna we did a lot of eating! A fun place is Naschmarket – a long narrow food market with a vast array of restaurants and stalls selling many different foods. But wait, what about the Mozart chocolates sold everywhere? Feeling very virtuous we didn’t try those, after all they are sold all over the world. But Sacher Torte? 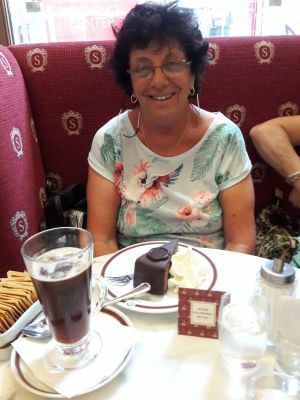 I stood in a queue in the boiling sun to get a table at the Sacher Café, home to the Original Sacher Torte. It was good but not amazing so we had to go to the nearby Mozart Café the next day to try their version of Sacher Torte. The Original Sacher Torte is based on a secret recipe from 1832 which is kept in a safe. It details the ingredients as well as the order of the various chocolates needed in the 34 different steps to make the cake which when baked is spread with apricot jam and covered with a firm chocolate icing. Having eaten one of the 360,000 big slices made every year, my verdict: when in Vienna eat apfelstrudel. Vienna in summer is a place of outdoor coffee houses and cafes and beautiful shopping areas. It demands more time than we had to attend a concert of Mozart's music, to enjoy a boat ride on the Danube, to visit Sigmund Freud’s house or the towering St Stephen's Cathedral which always gave us our bearings, or to visit the excellent art museums, Hundertwasserhaus and villages, and of course “the Kiss” by Klimt at the Belvedere Palace. In the end, despite my initial misgivings, I decided Vienna was well worth another visit.